It’s time to stop scoffing at the synesthetes: linking music to colors is totally normal. It’s not really about the notes, though. Researchers say the colors we find in music are actually the colors of the emotions the music makes us feel. Synesthetes are people whose sensory experiences overlap; they most often link letters or numbers to certain colors. 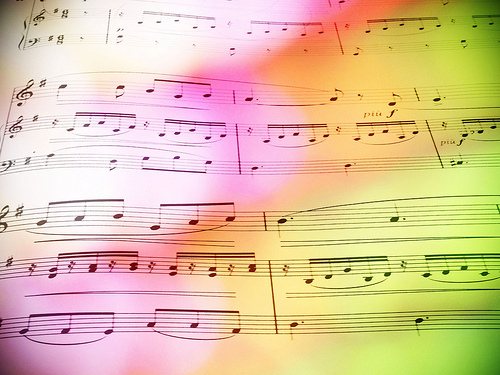 Music-color synesthesia, in which hearing music triggers the colors, is rarer. In fact, when Stephen Palmer and Karen Schloss at the University of California, Berkeley, set out to do a pilot study of music-color synesthetes, they couldn’t find any. So instead they began looking at the connections between music and colors in everybody else. As part of a larger study called the Berkeley Color Project, Palmer and Schloss included questions about music. Participants saw a grid of colors while listening to 18 brief clips of classical pieces, and chose the colors that were “most consistent” and "least consistent" with each selection. There were 18 music samples, representing every possible combination of 3 composers (Bach, Mozart, Brahms), 3 tempi (fast, medium, slow), and 2 modes (major or minor). The Andante movement of Bach's Brandenburg concerto in F major, for example, was Bach/major/slow. What emerged from this sea of lively Mozart and sad burnt-orange was a clear pattern. People linked uptempo and major-key music to colors that were warmer (yellower), lighter, and more vivid. Pieces with a slower tempo or in a minor key provoked the opposite colors: cooler (bluer), darker, and less saturated. Additionally, music that was both slow and in a major key tended to be greener. And although there wasn’t a difference between Mozart and Bach, Brahms—a Romantic composer who wrote the most recently of the three—leaned more to the slow and minor colors. To learn whether this consistency was strictly cultural, Palmer and Schloss found a collaborator at the University of Guadalajara who wanted to repeat the experiments with Mexican subjects. Despite Prada-León's hesitation, the results from her Mexican subjects fit snugly with the results from Americans. “The pattern of results for tempo, mode, and composer were remarkably similar,” the authors write. Also similar were the emotional ratings that Mexican and American subjects gave the musical selections, as well as the colors themselves. 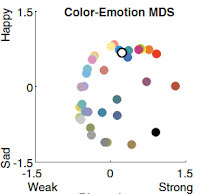 The emotions linked to each piece of music matched the emotions linked to that music's colors. This suggests that music itself doesn't make most people think of color. Instead, music triggers emotion—and that emotion is linked to a certain set of colors in the mind. The results are published in PNAS. Out of the eight emotions in the original list, only four were needed to explain the results: happy, sad, strong and weak. 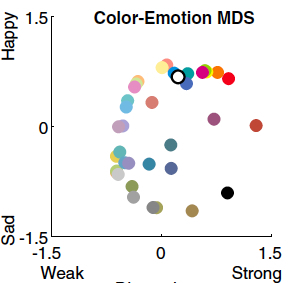 Happier and stronger colors were associated with upbeat, major-key tunes, while weaker and sadder colors were tied to slower, minor-key pieces. So what does all this tell us about actual synesthesia? Palmer says his group has now repeated a version of their experiments with real music-color synesthetes (after finally rounding some up). The results looked different. While non-synesthetes chose different colors depending on the tempo of a piece of music—even if it was the same musical line artificially sped up or slowed down—synesthetes didn't. "My current opinion is that synesthetes’ color experiences arise from direct mappings from sound to color," Palmer says. In their minds, emotions don't act as the middleman. However, "non-synesthetes’ color associations are indirect and do involve emotional mediation." But when researchers asked synesthetes to choose the colors that were most "emotionally consistent" with the music, rather than the colors they experienced in their minds, the synesthetes picked out the same colors as everyone else. Additionally, when researchers altered melodies just enough to change them from minor to major, synesthetes—like everyone else—"chose happier colors," Palmer says. There may be some common ground after all between synesthetes and others. The two groups probably won't agree, though, on the color of the mariachi music playing there. Images: top by tanakawho (via Flickr); bottom Palmer et al. This is wonderful! We are all the same when we get down inside our bare essential minds!